The originator and editor of the Kaufman Field Guides series is a lifelong naturalist. His fascination with birds developed at the age of six, and he went on to become one of the world's best-known bird experts, but his interests extend to every area of nature. 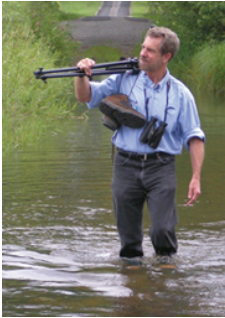 In addition to his work on the field guides, Kenn is also a Field Editor for Audubon Magazine, and a regular columnist for BirdWatching and Birds and Blooms. Kenn burst onto the North American birding scene as a teenager, hitch-hiking around the continent in pursuit of birds, an extended journey that was later chronicled in his memoir Kingbird Highway. Establishing an early reputation as an expert on bird identification and distribution, in 1984 he became associate editor of the journal American Birds, which was then published by the National Audubon Society, and began teaching birding workshops throughout the United States and Canada. During the same period he also began leading international birding and nature tours, eventually leading multiple trips to all seven continents and many oceanic islands. His first book, A Field Guide to Advanced Birding, published in the Peterson series in 1990, drew wide acclaim, and in 1992 he became the youngest person ever to receive the lifetime achievement award of the American Birding Association (the award was later renamed, and he received it again in 2008). Since the late 1990s, most of his attention has gone into the Kaufman Field Guides. Countless hours in the field doing research and photography are followed up with countless hours of writing, editing, and design work, collaborating with experts in each subject to ensure the highest quality in the finished books. Married in 2005, Kenn and his wife Kimberly Kaufman have worked together on many projects to bring more people to an interest in nature and to protect natural resources. Kimberly is currently the Executive Director of the Black Swamp Bird Observatory (BSBO), headquartered in Oak Harbor, Ohio. BSBO has been conducting research on bird migration in the Lake Erie Marsh Region of northwest Ohio for more than 20 years, and has also become a leader in promoting responsible ecotourism and in establishing youth programs in birding and natural history. (The Kaufmans were among the founders of the Ohio Young Birders Club, or OYBC, now sponsored by the observatory, and Kimberly has often served as an advisor to startups of clubs for young birders in other states, based on the successful OYBC model.) Both through Black Swamp Bird Observatory and through their own private initiatives, the Kaufmans are constantly working on efforts that involve public education and conservation, but they also find time for a wide variety of natural history pursuits, from blacklighting for moths to searching for salamanders, and (of course) always looking for birds. Some of their adventures are written up (when they have time!) on their popular blog, Birding With Kenn and Kimberly. Aside from the field guides, Kenn's best-known book is his Kingbird Highway. Published by Houghton Mifflin in 1997 and still in print, it has become something of a cult classic, especially among young birders. It tells the story of his adventures as a teenager in the 1970s, thumbing rides all over North America in an obsessive search for birds. A memoir of a different kind is his Flights Against the Sunset, published by Houghton Mifflin in 2008. This book tells a series of stories "from that frontier where the world of birds intersects with the world of the humans who pursue them." Both of these books were subsequently translated into Swedish by Lennart Nilsson, and published in Sweden by ellerstroms.